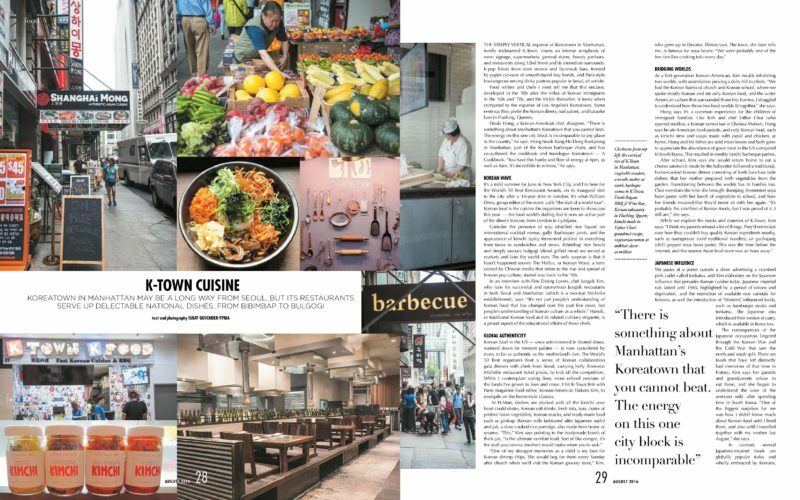 Koreatown in Manhattan may be a long way from Seoul, but its restaurants serve up delectable national dishes, from bibimbap to bulgogi. For Business Day WANTED, August 2016. 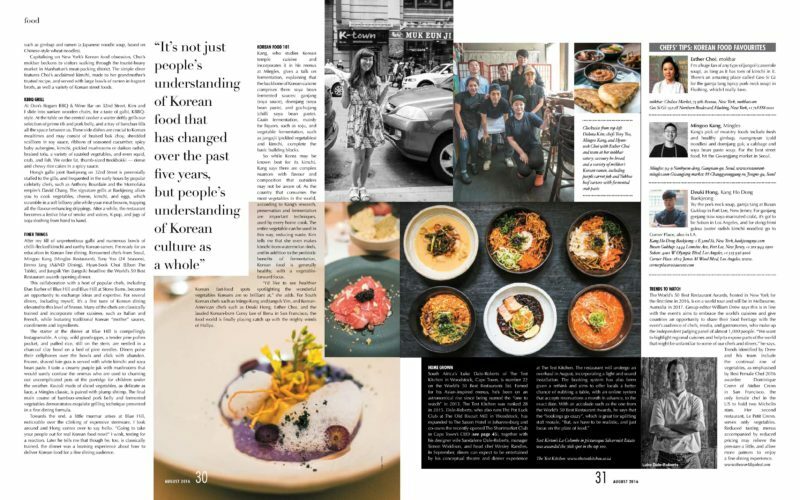 THe tight vertical rise of K-Town..
It’s a mild summer for June in New York City, and I’m here for the World’s 50 Best Restaurant Awards, on its inaugural visit to the city after a 14-year stint in London. It’s what William Drew, group editor of the event, calls “the start of a world tour”. 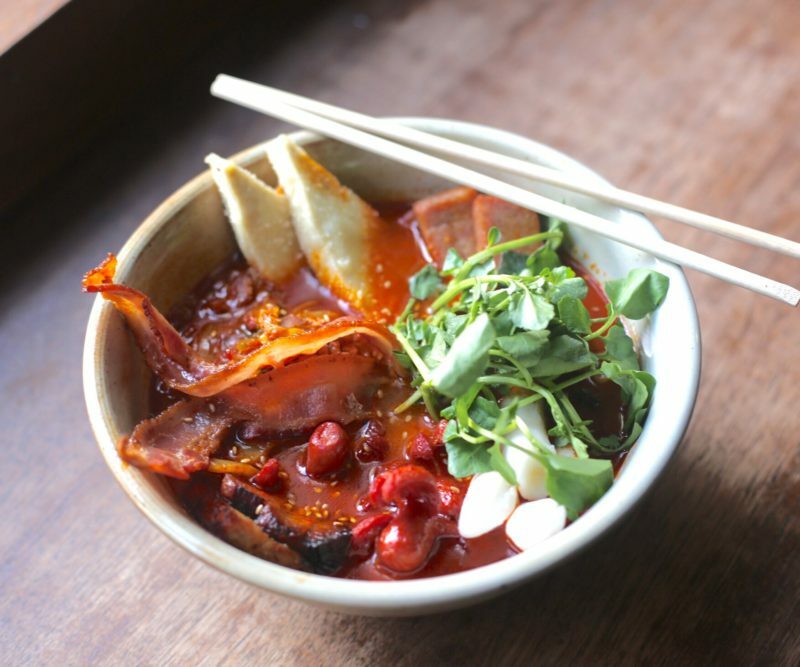 Korean food is the cuisine they’re keen to showcase this year, the food world’s darling that is now an active part of the diner’s lexicon from London to Ljubljana. Consider the presence of soju (distilled rice liquor) on international cocktail menus, galbi (barbeque) joints and the appearance of kimchi (spicy fermented pickles) in everything from tacos to sandwiches and stews. Bibimbap rice bowls and deeply savoury bulgogi (sliced grilled meat) are served at markets and fairs the world over. The only surprise is that it hasn’t happened sooner. The Hallyu, known as The Korean Wave, a term coined by Chinese media that refers to the rise and spread of Korean pop culture, started way back in the 90s. 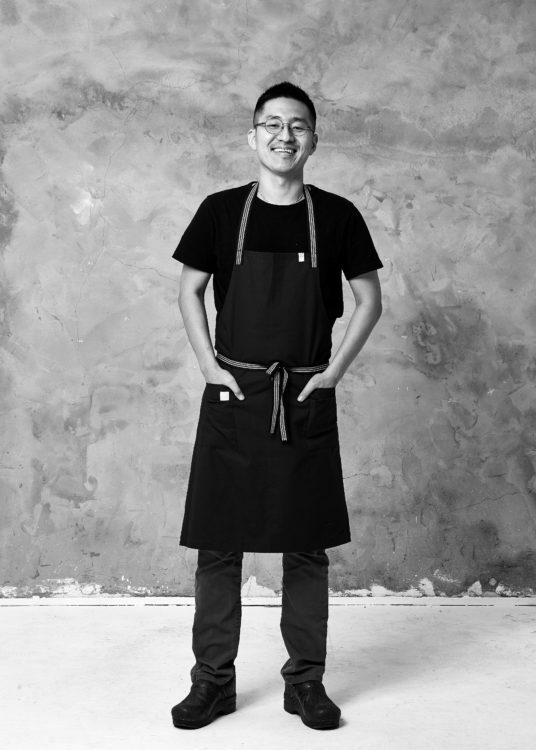 In an interview with The World’s 50 Best Restaurants, chef Jungsik Yim who runs his successful and eponymous Jungsik restaurants in both Seoul and Manhattan (a two-star Michelin establishment), says: “It’s not just people’s understanding of Korean food that has changed over the past five years, but people’s understanding of Korean culture as a whole.” Once administered in titrated doses, watered down for Western palates, Korean food in the U.S is considered by many to be as authentic as the motherland’s fare. 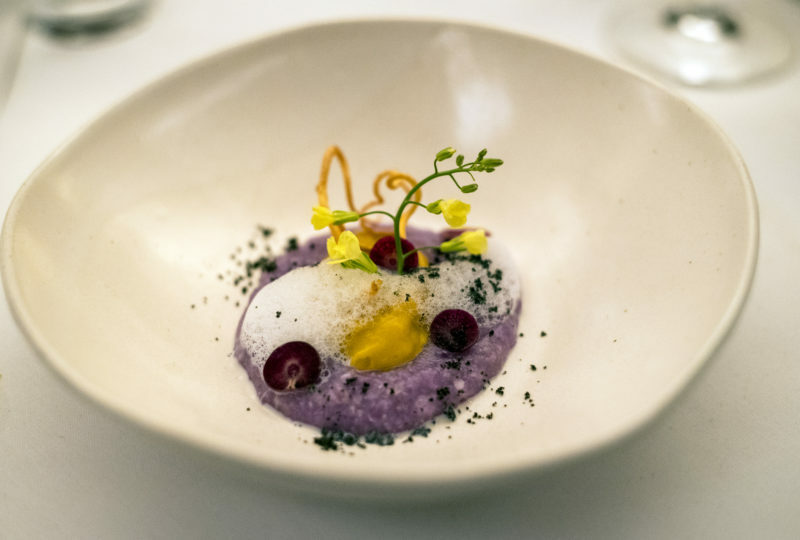 The World’s 50 Best organisers host a series of Korean collaboration gala dinners with revered chefs from Seoul, carrying hefty three-star Michelin restaurant ticket prices to kick off the competition. While I contemplate eating finer, more refined versions of the foods I’ve grown to love and crave, I hit K-Town first with Paste magazine food editor, Korean American Dakota Kim, to stockpile on the home-style classics. As a first-generation Korean American, Kim recalls inhabiting two worlds, with assimilation proving a daily hill to tackle. “We had the Korean barrio of church and Korean school, where we spoke mostly Korean and ate only Korean food, and the wider American culture that surrounded those tiny barrios. I struggled to understand how those two food worlds fit together,” she says. Hong, who shares a similar food history, says it’s a common experience for the children of immigrant families. 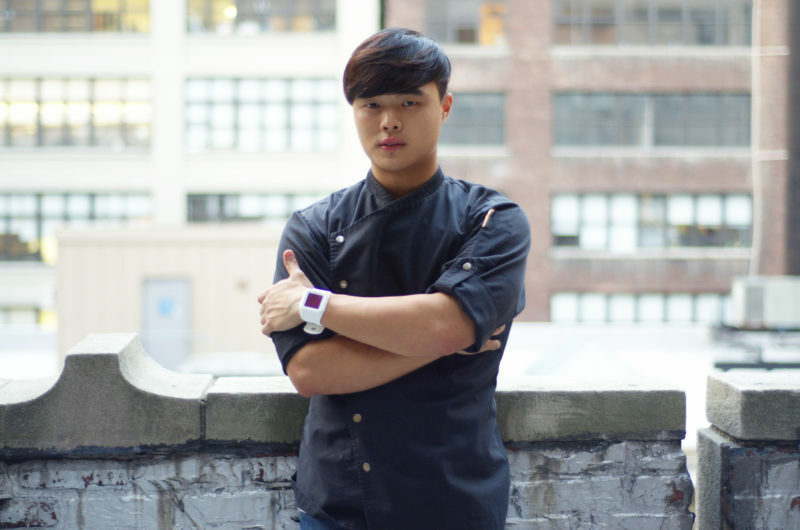 Like Kim and chef Esther Choi (who opened mokbar a Korean ramen bar in Chelsea Market), Hong says he ate American food outside and just Korean food like kimchi stew and soups made with oxtail and chicken at home. Hong and his father are avid meat-lovers and both grew to appreciate the abundance of good meat in the U.S compared to South Korea. This resulted in weekly family barbeque parties. After school, Kim says she would return home to eat a cheese sandwich made by the babysitter followed a traditional, home-cooked Korean dinner consisting of fresh banchan (vegetable side dishes) that her mother prepared with vegetables from the garden. Transitioning between the worlds has its hurdles too. Choi mentions the time she brought doenjang (fermented soybean paste) with her lunch of vegetables to school and how her Asian friends moaned that they’d never sit with her again. “It’s probably the smelliest of Korean foods but I was proud of it. I still am,” she says. We pause at a poster outside a diner advertising a crumbed pork cutlet called tonkatsu, and Kim elaborates on the Japanese influence that pervades Korean cuisine today. Japanese imperial rule lasted until 1945, highlighted by a period of rations and deprivation and the restriction of available rice varietals for Koreans, as well the introduction of “western” influenced foods like hamburger steaks and tonkatsu. The Japanese also introduced their version of curry, which is widely available across Korea too. The consequences of the Japanese occupation lingered through the Korean War and the Cold War that saw the north and south split. There are foods that have left distinctly bad memories of that time in history. Kim says her parents and grandparents refuse to eat these and she only began to understand the core of the aversion after examining their history and spending time in South Korea. 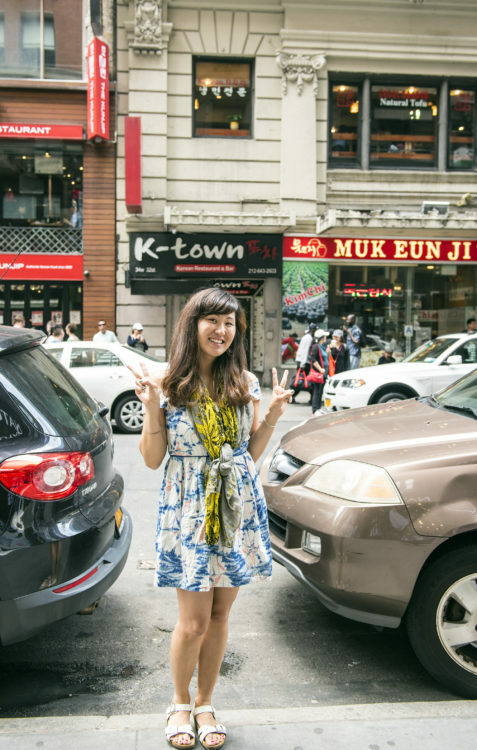 “One of the biggest surprises for me was how I didn’t know much about Korean food until I lived there, and also until I travelled together with my mother last August,” she shares. On the contrary, several Japanese-inspired foods are globally popular today and wholly embraced by Koreans, like gimbap and ramen (a Japanese noodle soup, based on Chinese-style wheat noodles) that appears in many Korean soups and broths. 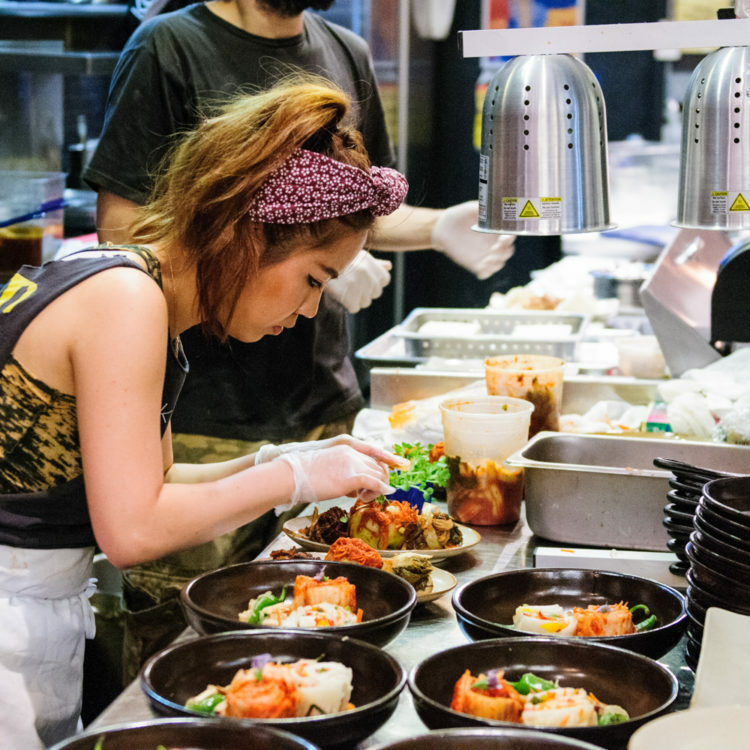 Capitalising on New York’s Korean food obsession, Choi’s mokbar beckons to visitors walking through the tourist-heavy market in Manhattan’s Meat Packing District. 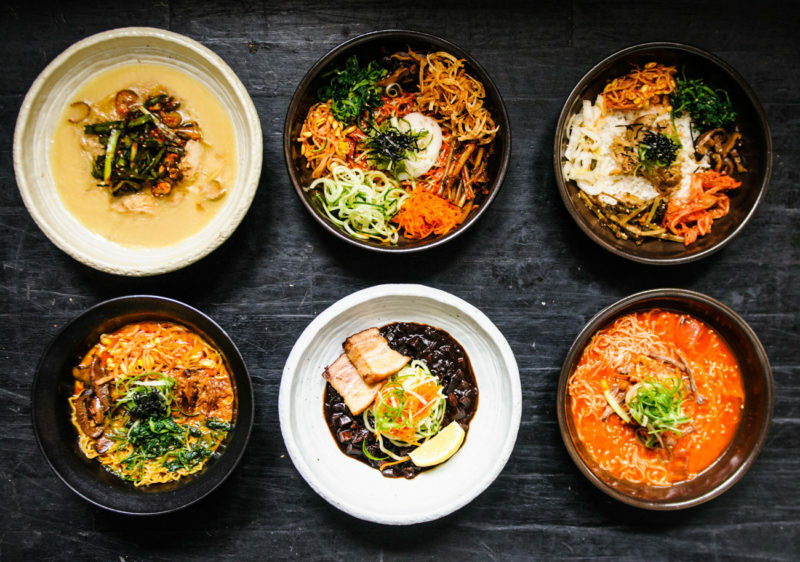 The simple diner features Choi’s acclaimed kimchi, made to her grandmother’s trusted recipe and served with large bowls of ramen in fragrant broth, as well a variety of Korean street foods. 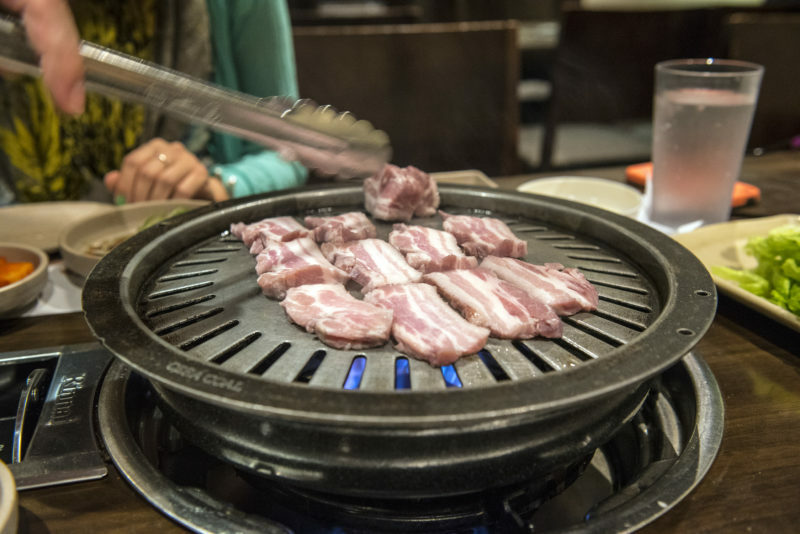 At Don’s Bogam BBQ & Wine Bar on 32nd Street, Kim and I slide into sunken wooden chairs with our feet belowground, for a taste of galbi, KBBQ–style. At the table on the central cooker a waiter deftly grills our selection of prime rib and pork belly and a tray of banchan fills all the space between us. These side dishes are crucial to Korean mealtimes and may consist of braised bok choy, shredded scallions in soy sauce, ribbons of seasoned cucumber, spicy baby aubergine, kimchi, pickled mushrooms or daikon radish, braised tofu and a variety of sautéed vegetables, and even squid, crab and fish. We order fat thumb-sized tteokbokki (there are many spellings), dense and chewy rice cakes in a spicy sauce that Kim says she craves when she’s travelling. 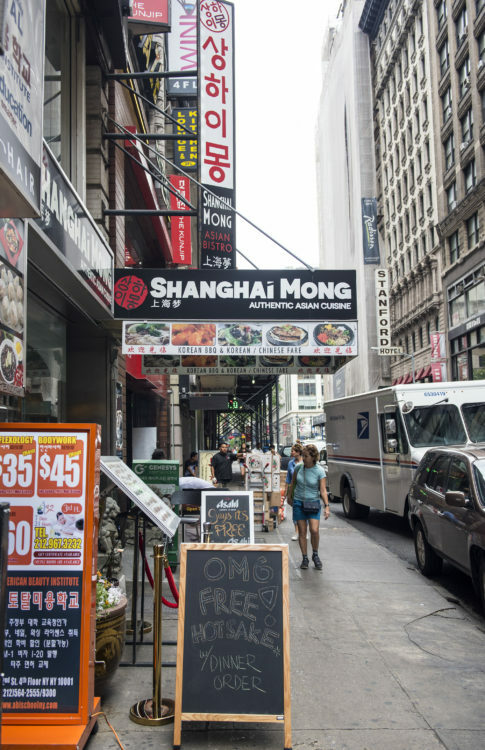 Hong’s galbi joint Baekjeong on 32nd Street is perennially stuffed to the gills and frequented in the early hours by popular celebrity chefs like Anthony Bourdain and the Momofuku empire’s David Chang (who, though Korean, isn’t a keen advocate for the nation). The signature grills at Baekjeong allow you to cook vegetables, cheese, kimchi and eggs which scramble in a soft billowy pile while your meat browns, trapping all the flavour-enhancing drippings. After a while, the restaurant becomes a festive blur of smoke and voices, K-pop and jugs of soju sloshing from hand-to-hand. As the grilled meat sizzles you can’t help but conjure up the image of Hong and his dad hosting their weekly KBBQ with friends and family at home. After my fill of unpretentious galbi and numerous bowls of chilli-flecked kimchi and earthy Korean ramen, I’m ready for an education in Korean fine dining. Renowned chefs from Seoul, Mingoo Kang (Mingles Restaurant), Tony Yoo (24 Seasons), Jinmo Jang (A&ND Dining), Hyun-Seok Choi (Elbon The Table) and Jungsik Yim headline the World’s 50 Best Restaurant awards opening dinner. This collaboration with a host of popular chefs, including Dan Barber of Blue Hill and Stone Barns becomes an opportunity to exchange ideas and expertise. For several diners, including myself, it’s a first taste of Korean dining elevated to this level of finesse. 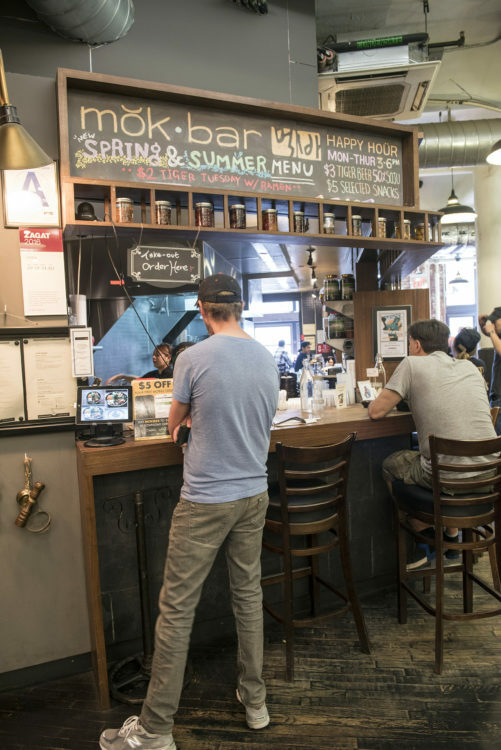 Many of the chefs are classically trained and incorporate other cuisines like Italian and French while featuring traditional Korean “mother” sauces, condiments and ingredients. The starter at the dinner at Blue Hill is compellingly Instagramable. Nestled in a charcoal clay bowl on a bed of pine needles is a crisp wild grasshopper, a tender pine pollen pocket and puffed rice, still on the stem. Diners poise their mobile phones over the bowls and click with abandon. Frozen shaved foie gras is served with white kimchi and soybean paste. I taste a creamy purple juk made of carrots with mushrooms that would surely confuse the ommas who are used to churning out uncomplicated pots of the porridge for children under the weather. Ravioli made of sliced vegetables, as delicate as lace, a Mingles’ classic, is paired with plump shrimp. The final main course of bamboo-smoked pork belly and fermented vegetables demonstrates exquisite grilling technique presented in a fine dining formula. Towards the end a little murmur arises at Blue Hill, noticeable over the clinking of expensive stemware. I look around and Hong, who’s dining with visiting media, comes over to say hello. “Going to take your people out for real Korean food now?” I wink, testing for a reaction. Later he tells me that though he, too, is classically trained, the dinner was a learning experience for him about how to deliver Korean food for a fine dining audience. Kang, who studies Korean temple cuisine and incorporates it in his menus at Mingles, addresses a crowd of media during a talk on fermentation, explaining that the backbone of Korean cuisine comprises three soybean fermented sauces: ganjang (soy sauce), doenjang (soybean paste) and gochujang (chilli soybean paste). He’s introduced a few of us to all of these in some form, at the dinner at Blue Hill. Grain fermentation, mainly for liquors such as soju and vegetable fermentation such as jangajii (pickled vegetables) and kimchi complete the basic building blocks. 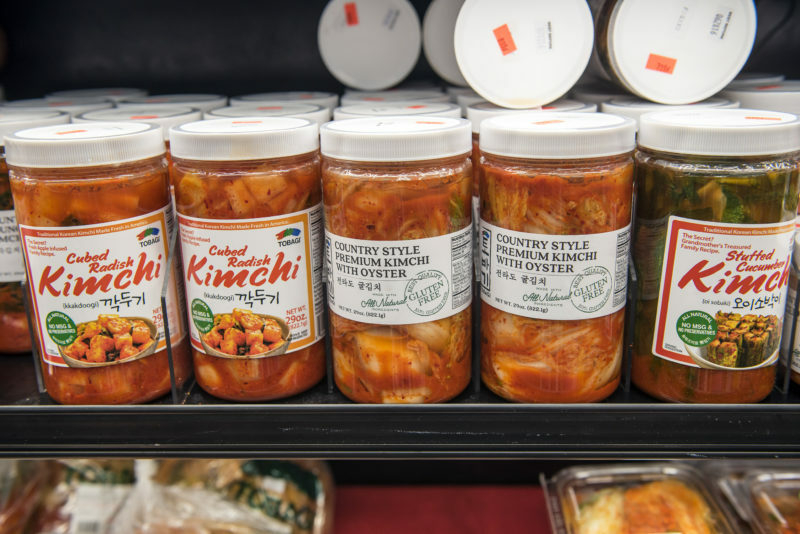 So while Korea may be known best for its kimchi, Kang says, there are complex nuances with flavour and composition that outsiders may not be aware of. As a nation who consumes the most vegetables in the world, according to Kang’s research, preservation and fermentation are important techniques, used by every home cook. The entire vegetable can be used in this way, reducing waste. Kim tells me that she even makes kimchi from watermelon rinds and apart from the probiotic benefits of fermentation, Korean food is generally healthy with a vegetable-forward focus. “I’d like to see healthier Korean fast-food spots spotlighting the wonderful vegetables Koreans are so brilliant at,” she adds. 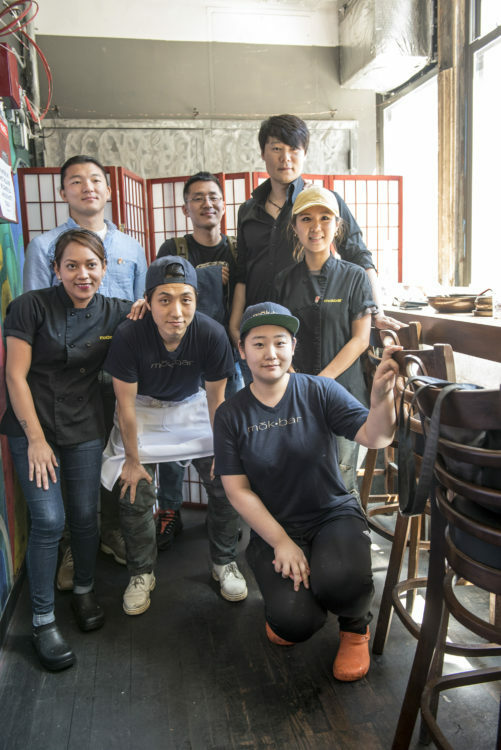 For South Korean chefs like Mingo Kang and Jungsik Yim and Korean American chefs like Deuki Hong, Esther Choi and the lauded South Korean-born Corey Lee of Benu in San Francisco, the food world is finally playing catch up with the mighty winds of Hallyu. Kang’s pick of must-try foods include fresh and healthy gim bab, naengmyeon (cold noodles) and doenjang guk, a cabbage and soybean paste soup. For the best street food, hit the Gwangjang market: 88 Changgyeonggung-ro, Jongno-gu, Seoul. For, ganjang gyejang (raw soy-marinated crab), it’s got to be Soban in Los Angeles and for dongchimi guksu (water radish kimchi noodles) go to Corner Place, also in LA. The World’s 50 Best Restaurant Awards, hosted in New York for the first time this year is on a world tour and will be in Melbourne, Australia in 2017. Group editor William Drew says this is in line with the event’s aims to embrace the world’s cuisines and give countries an opportunity to share their food heritage with the event’s audience of top chefs, media and gastronomes who make up the independent judging panel of almost 1000. 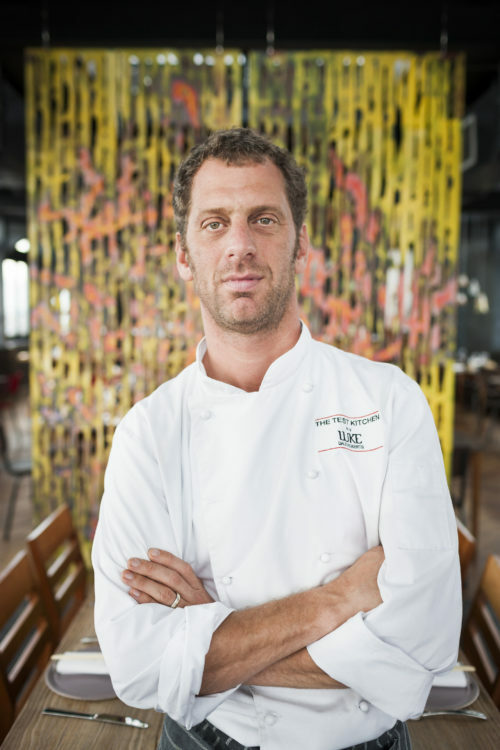 “We want to highlight regional cuisines and help to expose parts of the world that might be unfamiliar to some of our chefs and diners,” he says. Trends going forward identified by Drew and his team include the continual rise of vegetables, as emphasised by Best Female Chef 2016 awardee Dominique Crenn of Atelier Crenn in San Francisco, the only female chef in the U.S to hold two Michelin stars. Her second restaurant Le Petit Crenn only serves vegetables and she’s made a vocal call for chefs and eaters to embrace this. Reduced tasting menus accompanied by reduced pricing may relieve the pressure a little and allow more patrons to enjoy a fine dining experience. At the same time, Drew predicts that service will move away from the stuffy “white tablecloth and silver service” of old towards a more relaxed, though no less professional approach. Scot Kirton’s La Colombe in picturesque Silvermist Estate was awarded the 76th spot on the top 100.